Campuses from Delhi NCR were invited to participate in this inter-college competition where a group of students were asked to identify one key (a) sustainability challenge in the their respective campuses (b) design a campaign to transform the problem into an opportunity (c) implement it over a specified period (d) evaluate and assess impact and compete for the ‘Genpact Campus Impact Award’. Various institutes applied for the ‘Campus Impact Challenge’. Each college was required to make a Campus Impact Group (CIG) comprising 25 students and a faculty member. 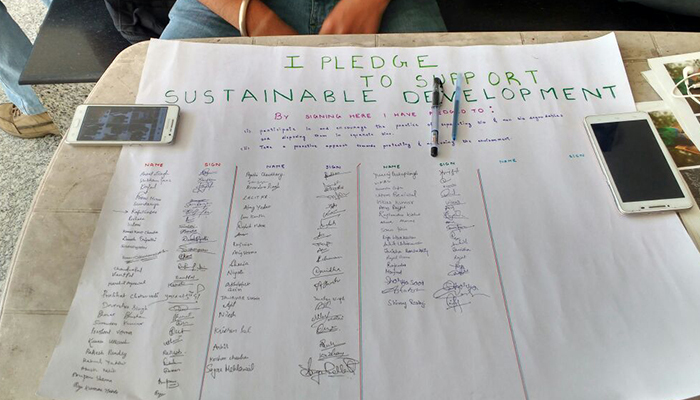 Further, the CIG identified a sustainability challenge in their campus and submitted a campaign idea to address it. Shortlisted entries progressed to the second level of the challenge, which involves the successful launch of the campaign by each CIG in their respective college campuses and its further implementation. The participating colleges were asked to submit a comprehensive report on their campaign along with evidence. Based on the reports, 8 colleges were shortlisted for the next level. Based on the evaluators’ feedback, 8 campaigns were selected for the day long Campus Impact Meet for their final presentation. Top 3 campaigns will be awarded the ‘Genpact Campus Impact Award’. Objective - To spread awareness regarding the discriminatory practices against girls in various communities. Project Summary - The focus area of the project was nutrition and health services. Appropriate activities and interventions were planned to work towards the abolishment of the traditional practices with are harmful to women. This was done by conducting workshops about the pressing issues in the neighborhood communities. Social media was also used extensively in order to increase the outreach of the project. The expected impact was a change in mindset of people and upliftment of women’s status in the society. Objective - To spread awareness regarding the environmental effects of mismanaged solid waste among the marginalized women living in the slums near the university campus. Project Summary - The project aimed to ensure its proper management through its recycling and treatment. The slum community was also involved with training sessions, to become social entrepreneurs. The main impact of the project was employment of the local women in rope making, along with reduction in plastic wastage. An initiative called ‘THE LUNCHBOX’, which involved women of the nearby slum areas making tiffins for the students of nearby college proved very successful and has been able to bring about a better change in the lives of these women who learnt to take a step for a better life. Objective - To create awareness among the students regarding sustainable consumption by optimizing the usage of resources used in the institute and minimizing the waste generated. Project Summary - The main aim was to optimize the usage of resources used in the institute and minimizing the waste generated. This was done through seminars and workshops to spread awareness. Optimization of resource usage was ensured through self-auditing and monitoring using a standardized checklist made for hotels and restaurants resource consumption. Waste minimization was achieved through waste segregation and weighing of waste produced by the institute and projecting it regularly on the notice board. The project was successful in reducing average plate waste from 19.55 kgs per day to 2.5 Kgs per day with 100% food utilization of left- over food. Eleven liters of water was saved through decanters in the lunch service on a daily basis for servicing 32 covers. 8% energy reduction was also achieved. Objective - To improve the condition of stray dogs in the campus and in colleges around the south campus area of Delhi University. Project Summary - Stray dogs are often considered a menace and they live in the most deplorable conditions. People in India prefer to pet the pedigree breed instead of the Desi breed (the Indian dog seen as a stray on the streets of India). Under the ABC programme, the dogs are picked up from a locality by the municipal corporation are then taken to an NGO (for animal welfare) where they are sterilized and given an anti-rabies vaccination and thereafter are dropped back in the same locality from where they were picked up. Delhi, alone, has around half a million stray dog population. The project aims to improve the condition of stray dogs in the campus and in colleges around the University by providing food, water and shelter to the dogs. It also aims to exhibit people’s participation in the ABC programme by making the college campus rabies free and creating an atmosphere where both dogs and humans co-exist in perfect harmony. Under the project, the dogs were sterilized and vaccinated directly through an NGO. The project has been successful in providing the dogs social acceptance and a healthy life by regularly feeding them and taking care of their medical problems. Till date, 14 Dogs in the campus have benefited directly and around 2000 students and 200 staff of the college have been made part of the impact. This project also helped generate revenue for the underprivileged women by teaching the skill of making dog collars and leashes. As a result, there are 10 Self-employed women and Rs 16,800 revenue has been generated as of date from sale of 100 collars and 27 leashes. Project Name Sanitation and Health: "The Need of the Hour"
Objective - To work in the area of health and sanitation with adolescent girls in neighborhoods of the college campus. Project Summary - The project aimed at spreading awareness on menstruation related issues and safe sanitation practices in the community. Training was given to college students to take sessions in the neighboring slums with women and girls. The community was also sensitised on the benefits and importance of using toilets and and also provided information on making use of government schemes to constructs toilets at their homes. 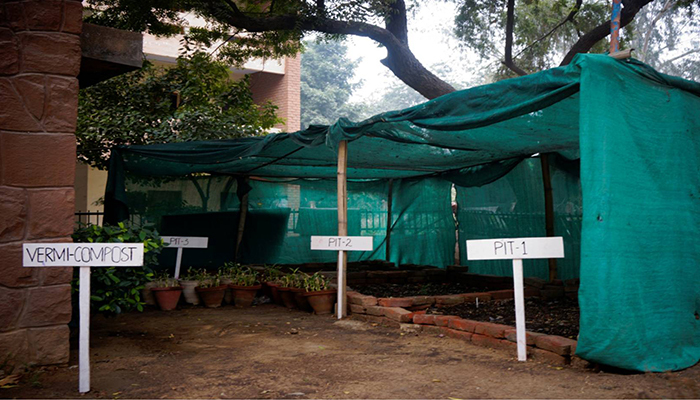 Objective - To create auxiliary nesting habitats for birds around the college campus. Project Summary - The project aimed at educating students on the role and importance of birds in the environment. 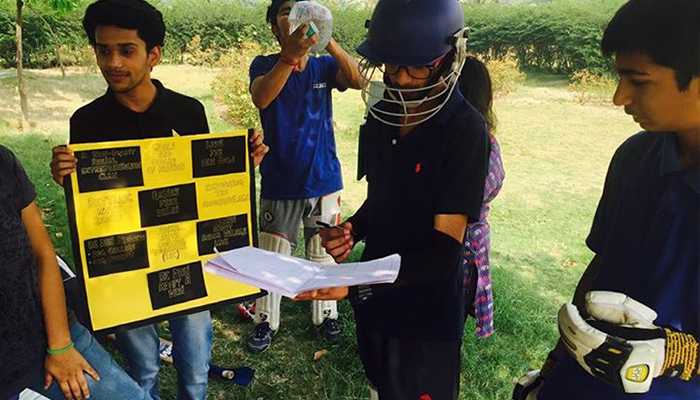 Awareness generation was undertaken about the loss of habitat of birds in Delhi and NCR region and the students were encouraged to learn about the flora and fauna on the campus. Bird houses, which were using sustainable materials, were placed around the campus as auxiliary nesting sites to help in attracting various bird species from around the area. Project Summary - The idea of the project is to make the most effective and suitable method for composting. The college canteen everyday produces a significant amount of organic waste every day and is thrown in the dustbins along with other non-biodegradable waste. The campus ambassadors put up a separate bin for wet food waste in and around the cafeteria from where all the waste shall be collected will treated through three different methods of composting. The end result of the project was determination of the most effective and suitable method for composting. Its impact was on awareness generation regarding solid waste management and production and usage of organic manure through the three methods. 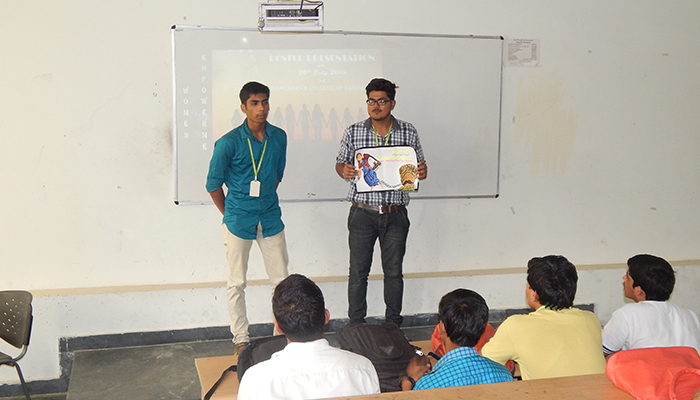 Project Summary - The project aimed to work on sustainable consumption of paper as a resource in the college campus. The idea was to train the staff and students to reduce their consumption and wastage of paper, and train the slum community living around the campus to recycle the paper consumed by the college. The idea is to reinforce the 3 Rs, Reuse, Reduce and Recycle among the people in and around the college. They were in the belief that once the community is made aware and capacitated with the recycling techniques, the paper will be recycled and reused. The impact of the project was empowerment of the community and reduction in wastage of paper.